Bean Bags R Us NewsDog BedsWhat are the Top Three Uses For A Giant Bean Bag? One of the best things about giant bean bag furniture is that you can use it in many creative ways that family members will love. This versatility makes it a very beneficial addition to any room in the home. Creative uses range from a fun couch for play areas and family rooms, to unique and cozy large dog beds. Other possibilities include comfortable outdoor seating for patios and beside the swimming pool! One of the best ways to use a giant bean bag is to let it go to the dogs! These generously sized pieces are the perfect place for large breeds to sleep on because dogs have plenty of space! 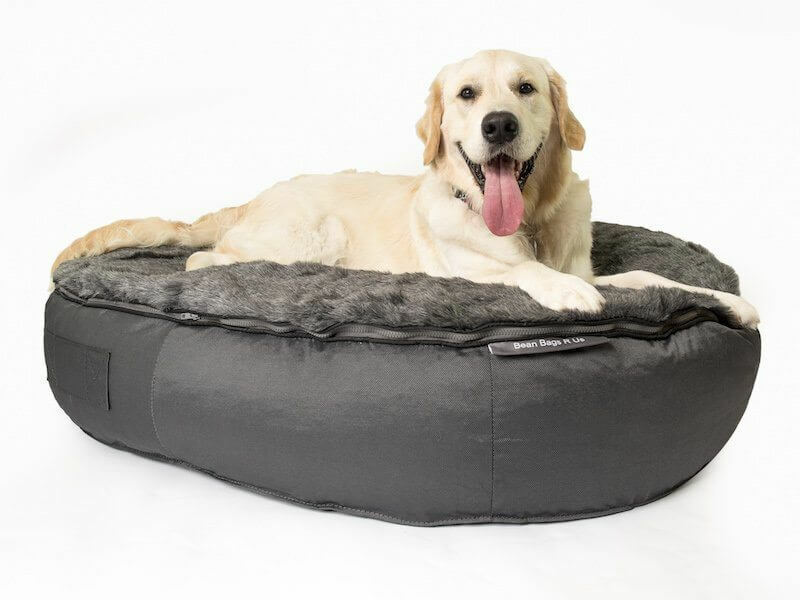 A key advantage of choosing a bean bag instead of a traditional pet bed is that they are often far less expensive and are much easier to keep clean. Ease of cleaning can be critical if the dog tends to shed a lot. Cleaning bean bags is often as easy as gently wiping down the surface with a damp cloth. Depending on the style, the cover can also be removed and washed, which is something that many pet beds lack. Another benefit is that many of the giant bean bags can be used outdoors as well. For some pet owners, this is an essential feature as it means the pet has somewhere to rest outside. Kids and teens love furniture that is fun and comfortable but will still last a long time, which is why bean bags are always a popular option for their rooms. The longevity is something that all parents should consider because many kids tend to outgrow their furniture every year or two. Kid’s ability to rapidly grow out of furnishings leaves many parents looking for options that will last longer, such as an oversized chair. Choosing giant bean bags in bright colours is the perfect choice because they are large enough that most children will not be able to outgrow them as they are designed to be large enough for adults. You can use these giant bean bag chairs in a couple of different ways in a child’s room. Try turning it into a mini sofa for them to relax on, or even let it double as a guest bed when they have friends over! To use it as a mini sofa, prop it up against the wall so that it has a sofa-like shape. A few small cushions or pillows can also be added to make it more like a sofa. If you need to accommodate larger children, the bean bag can be adjusted to be like a reclining chair. Just position it against a wall, or adjust the stuffing so that it sits more upright. Another great use for these oversize chairs is as a guest bed when kids have their friends over. To do this, flatten it out, and put a sheet or cover over it. After that, add a pillow and a blanket, and they’re set! Depending on the size, these bean bags can fit one to two children with room to spare, making it the perfect choice for sleepovers because they do not have to sleep on the floor! Teens can also benefit from these chairs because they are still large enough for them to rest on them comfortably. For those who have teens that are quite tall, this can be a big feature as indoor furniture can be hard to find for them. Teenagers can use these chairs as a study spot, or even as an excellent seat for playing video games. They can also place several of them together to create a seating area or even as a spare bed! Some giant bean bags can also be used as outdoor furniture, making them the perfect choice for a patio lounger or as a poolside chair. They can also be used near campfires to create comfortable seating for everyone. Before you use your chair in an outdoor environment, check to make sure it is suitable for outdoor use. Often products will be listed as waterproof or water resistant or may feature a cover that is easy to clean. Some products may have drainage holes or utilise mesh fabric. If the giant bean bags do get wet, make sure that it has time to dry before the next use. You may leave it on the patio and let it drip dry in the sun, or rest it on a rail or against a wall to allow the water to drain out. This entry was posted in Dog Beds, Kids Bean Bags, Large Bean Bags.